I’m delighted to be taking part in the very first blogtour for the very first book from new digital publisher Verve. As the title suggests, this is a spy thriller novel. 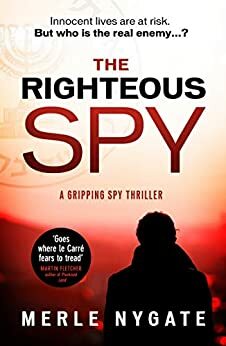 So just for fun, for my blog tour stop, here is a quiz to see how much you know about fictional spies. Your answers can be left in the comment box if you would like to but watch out on Twitter (@Verve_Books) tomorrow for the answers! In which Bond film did Judi Dench first appear as M? Whose wife is Bill Haydn sleeping with in Tinker Tailor Soldier Spy? What job does James Wormold do in Our Man in Havana? In Mick Herron’s Slow Horses, where is the location of the office? In the Americans, what’s the name of the neighbour who works for the FBI and lives across the street from Soviet agents, Philip and Elizabeth? Verve Books is a dynamic digital publisher, inspired by a love of great, original, page-turning fiction led by a team of passionate book lovers. In a swiftly changing world where great ideas don’t wait for long lead times, we understand that readers want the best books now and that’s why we’re focused on delivering high quality eBooks around the world. With many years’ experience in traditional publishing, our team has editorial and marketing expertise which is second-to-none. Verve is open to submissions from published and unpublished authors of commercial fiction across all genres. As the company name suggests, each book project will be approached with ‘vigour, spirit and enthusiasm’.